Add extra storage to your bedroom with American wood Home’s Crescent Point 6 Drawer Dresser. The dresser’s spacious drawers give you more room to organize your clothing so you won’t have to worry about squeezing everything into your closet. With 6 drawers, you can sort your pants, tees, buttoned shirts and undergarments separately so you know exactly where to find them as you dress every morning. 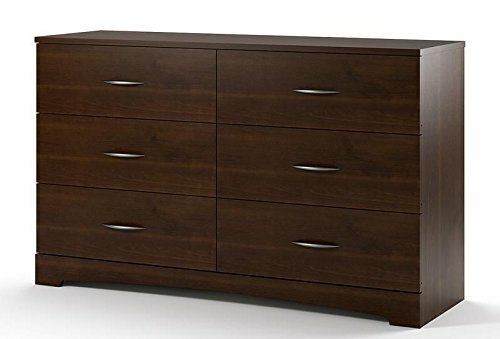 With a gorgeous dark brown finish, complementary silver handles and a decorative arched front foot this 6 drawer dresser will enhance the sophisticated style of your bedroom. The dresser is constructed of laminated particleboard with laminated linen paper lining the inside of the drawers. Measuring at 32 3/8"H x 53 5/6"W x 15 5/8"D, the dresser requires 2 people for proper assembly. Two people are required for assembly and moving this dresser. Dimensions: 32 3/8"H x 53 5/6"W x 15 5/8"d. Shipping weight is approximately 136.4 lbs.